Laurence Lesser, New England Conservatory’s Walter W. Naumburg Chair in Music and Artistic Director of First Monday at Jordan Hall, will perform the Bach Six Suites for Unaccompanied Cello in a single concert, March 28 at 7:30 p.m. in NEC’s Jordan Hall. The concert, which is free and open to the public, will be preceded at 5 p.m. in Williams Hall by a pre-concert talk given by Christoph Wolff, Adams University Professor at Harvard University. A renowned Bach scholar, Dr. Wolff is is author of Johann Sebastian Bach—The Learned Musician. In 1999, he received an Honorary Doctor of Music degree from NEC. BMInt: Why are you scaling this Parnassus now? 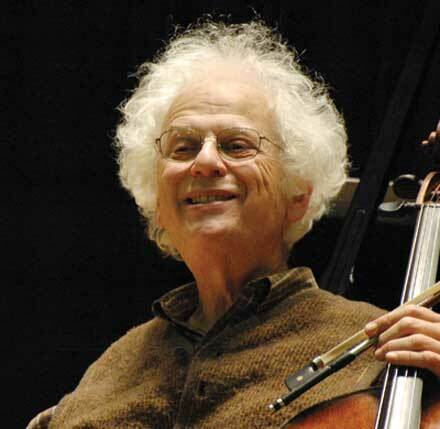 Laurence Lesser: Well, at the age of 70, I performed and recorded all of the Beethoven cello sonatas and variations [A CD and a DVD with a fascinating self-interview are here]. I’m now 72, and the clock will never stop ticking until it stops. Now is a very good moment to do it. I’ve performed all the Suites many times over the years, of course, but never before in one evening. [Lesser’s performances in Toronto in 2000 inspired The Cello Suites by Eric Siblin] And I should add that the evening will be very long. Don’t expect to leave before 10:30. I’ll have the benefit of adrenalin, but I hope the audience will too. Will there be a dramatic pin spot in an otherwise darkened hall? I want people to experience this as a regular concert. I will be playing from music and am not really interested in that kind of dramatic stuff. The music is going to speak for itself, and if it doesn’t, then I haven’t done a good job. I’m trying to play the music for the people who are listening — that’s who I am. And I should add that I’m playing from music because the Bach Cello Suites constitute a kind of bible for cellists. You go to a church or a synagogue and everyone reads, no one recites from memory. It’s more important for me to deliver my feelings on this central text than to dazzle people with feats of memory from my increasingly old brain. Well, I played at Casals’s funeral, but that’s another story….He was the first to record all six Suites. Theories about Baroque performance practices come and go, but Casals’s recording remains profoundly artistic. The fact that J.S. Bach also made the fifth cello suite for lute has fascinated me for a very long time. When I was studying with Gregor Piatigorsky in Los Angeles in the 1960s, he shared with me a photocopy of the lute suite and I almost immediately began to incorporate some of its elements into the cello suite. I did this because, here at last, there was a true manuscript of at least one work of the cello suites, albeit in a different key (g minor) and for a different instrument. Over the years, from time to time, there have been tantalizing reports of rediscovered Bach manuscripts, but unfortunately, never of the cello suites. Luckily, we have four copies of the works – two made in his lifetime and two in the late 18th century. Of the two earlier ones – done by his wife, Anna Magdalena Bach and by a contemporary musician, Johann Peter Kellner – most often the AMB is used as the general source. It is, however close it may be to the composer’s manuscript, still with its share of obvious errors and very irregular bowings. The Kellner manuscript has its limitations as well, but is also a valuable source of information. The lute version (“Pièces pour la Luth à Monsieur Schouster par J.S. Bach”) is written on paper said to be from the same period as AMB and Kellner, or roughly 1727-29. There is no certain way to know which version came first. But, for me, the chance to see and hear how Bach thought, writing for an instrument without bow, but with more strings, is compelling. Not only do we learn of sometimes quite unexpected harmonies, we also have precise examples of how he went about ornamentation. So, in order to share all this with the listener, I set about combining the two versions. My plan is straightforward: The Prelude incorporates as much lute detail as I could keep. And, since all the dance movements that follow are in repeated sections, I use the cello version as the first statement and the lute version as an ornamented reprise. Obviously, a 4-stringed instrument cannot do all a lute can do. So I have had to make choices of what to omit. But, with rare exception, I have been careful not to add notes. Thus, every note unfamiliar to those knowing the cello version is for sure a note written by Bach. My hope is that, even if others do not play this version, they will at least have a broader understanding of what might be implied in the relatively spare cello version. Interestingly, the sarabande is almost untouched, with the exception of a handful of harmonies that can only be termed revelatory. For more information about the concert, check the NEC website here or call the NEC Concert Line at 617-585-1122. I await a more erudite account. So do we. We were promised it yesterday. … and it is now up.